Thu., April 19, 2018, 8:03 a.m.
A GRIP ON SPORTS • Bad news. My neck is hurting. Probably similar to what Mike Leake’s neck feels like after that awful seventh inning last night. Read on. Which is why a 1-1 game going into the top of the seventh inning can turn into an 7-1 Houston win before most of Safeco’s bail-out crowd made it to their cars. Nothing deflates a stadium, or empties it quicker, than a starting pitcher running into a brick wall in the late innings and the manager a tad late to make the decision to go to the bullpen. 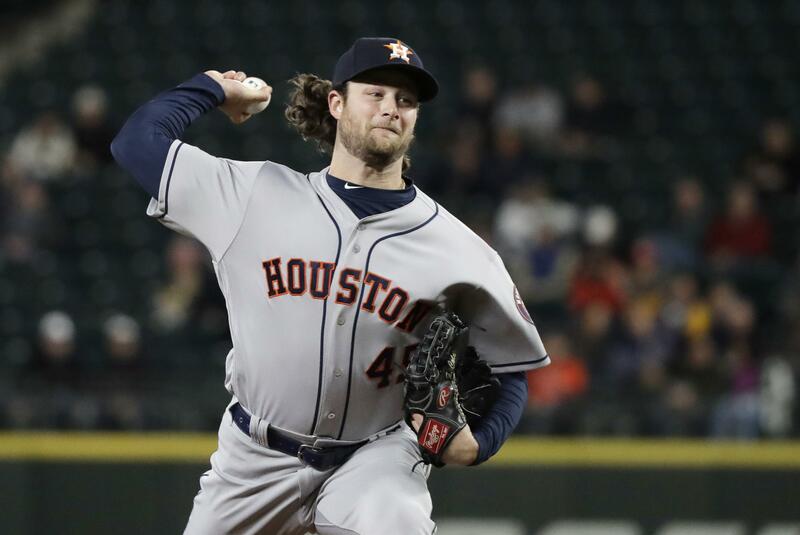 When both of those things happened last night, the Astros put up a six spot, Leake had his worst outing, numbers-wise, as a Seattle pitcher and the Mariners received another lesson in what good pitching can do. Well, that last point was proven all night. By the newest Astro ace (how many do they have?) Gerrit Cole. Houston went out and grabbed the former Pittsburgh starter this offseason, making the best team in baseball even better. As for Leake, his first six innings were just as good. But in the seventh he seemed to lose it, walking Josh Reddick, then giving up a double, single and a double before Scott Servais went to the pen. Whether or not Nick Vincent could close the door – he couldn’t – was immaterial. The game was out of hand. To give Servais a pass, Leake’s pitch count was low, he had given up just four hits and seemed poised to give the bullpen a break. Then it all changed. WSU: It was not the best of weeks around Bohler Gym, with a university investigation of former associate athletic director John Lucier concluding he violated Title IX policies. … Elsewhere in the Pac-12, Oregon is changing how they run the ball a bit, giving quarterback Justin Herbert some new options. … Washington, sporting nice shiny helmets, has a new No. 1 option at receiver. … Oregon State is still trying to determine its top quarterback option. … In basketball, Arizona attracted a grad transfer from Pitt, a school that did not win an ACC game last season. … I just saw this story on Jake Locker and wanted to pass it along. Gonzaga: Larry Weir’s Press Box pod yesterday had a guest you don’t want to miss, Gonzaga radio play-by-play voice Tom Hudson. … The WCC golf championships wrapped up yesterday. … Around the WCC, BYU guard Elijah Bryant is leaving a year early, headed to the pro ranks. EWU: The Eagles’ second scrimmage is coming up this Saturday in Cheney, with the offensive line leading the way for that side of the ball. Jim Allen has both stories. … Jim also delved into basketball a bit, summarizing Bogdan Bliznyuk’s recent showing in front of NBA scouts. Idaho: When I was covering Washington State about a decade ago, David Ungerer would run around the field after practice, along with many of the coaching staff’s children. Now he stands alone as a senior receiver at Idaho. Peter Harriman has his story. CCS: The Sasquatch baseball team is no longer in first in the NWAC. Chiefs: Everett and Tri-City will meet for the WHL Western Conference title. Preps: It’s Thursday, so that means there are not only roundups of yesterday’s action, but also stories on the folks behind the results. Whitney Ogden has one of those, a feature on Post Falls’ Richelle Ashburn, a state championship player turned coach. … There are still basketball awards rolling in for players in the area and Dave Nichols summarizes them all in this story. Plus there are local academic awards to pass along. … Greg Lee has a track and field notebook. … Now for the roundups from softball, track, baseball, soccer and golf. Mariners: Before the 7-1 loss last night, the M’s activated Ben Gamel. That gives them five outfielders. How long will that last? … Mike Zunino will be back soon. … Felix Hernandez comes from Venezuela. The state of his home country bothers him deeply. … Teams at Safeco may not be able to chew tobacco soon. If smokeless tobacco is so bad (and it certainly isn’t healthy) than why not ban it everywhere? Seahawks: Did the Hawks trade Michael Bennett because of inattentiveness in meetings? … So what comes first in the draft, another tight end or offensive line help? Sounders: If Ozzie Alonso can stay healthy, the Sounders will be a better team. Published: April 19, 2018, 8:03 a.m.